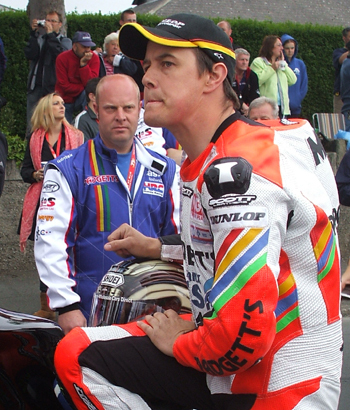 The 2008 Dainese Senior TT, for many the highlight of the Isle of Man TT, is scheduled to start at midday on Friday. After what has been a stunning TT, with some of the most competitive racing the famous Mountain circuit has seen in recent years, there is massive anticipation ahead of the six-lap Senior. Looking at the form of the field seen this year and at previous TTs, it is hard to say who will take the top step of the podium and lift the iconic Senior Trophy – the same trophy that was handed out at the very first TT 101 years ago. What is for sure is that the Dainese Senior TT, arguably the race everyone wants to win at the Isle of Man TT, is an event not to be missed! Last year, John McGuinness stormed to victory, taking his 13th TT win and shattering the outright lap record with an average speed of 130.354mph – the first time the TT course had been lapped at an average speed of more than 130mph. He will be keen to repeat that performance to end what has been, by his standards, a disappointing TT on a high. During Practice Week, McGuinness put in the fastest Superbike time on his 1000cc Fireblade, and during Saturday’s Dainese Superbike race he put in a blistering first lap, moving up to second, before he was forced to retire. However, his Padgett’s Honda will be the target of some of the best road racers on Earth. Before the 2008 TT got underway, Guy Martin was favourite to dominate. However, mechanical woes and the stunning speed of the TAS Suzuki machines have left him without victory. After a strong showing in practice, Martin dominated the early stages of Saturday’s Superbike race, leading for half the six-lap distance before the bike let him down. The popular Hydrex Bike Animal Honda rider will be determined not to leave the Isle of Man without a TT win this year, and if the machinery is up to the job he will be a hard man to beat. However, the team of the 2008 TT has, without doubt, been Relentless by TAS Suzuki. 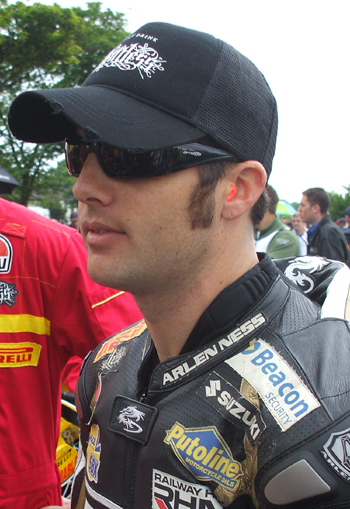 Cameron Donald, in only his second year at the event, claimed victory in the Superbike and Scottish Life International Superstock races, and teammate Bruce Anstey was victorious in both Relentless Supersport Junior TT races, although he was stripped of the win from the first race due to a technical infringement. Without the disqualification, which handed victory to AIM Yamaha’s Steve Plater, TAS would have won every solo TT so far this year. Australian Donald was stunningly fast in practice, second only to McGuinness on the Superbike, and must start the Senior as one of the favourites, while his Kiwi teammate, a seven-times TT winner, cannot be discounted. Seasoned campaigners Adrian Archibald, who finished third in Saturday’s Superbike race, and Ian Lougher, who has had some strong runs, are also worth keeping an eye on, as is Ryan Farquhar who stunned many with a superb sixth place in the Superbike race on a Superstock machine. Plater will be hoping to add another TT win to his tally, as will teammate Ian Hutchinson, who has so far only managed a second place in 2008. However, both AIM Yamaha riders have been hit by mechanical problems during the week. There are many more in the field who will be out to make an impression, including young chargers Conor Cummins and Gary Johnson, whose performance this year has impressed everyone. Plus, Keith Amor, who finished third in Monday’s first Supersport race after Anstey’s disqualification, will be chasing a top three finish so he gets a chance to taste the champagne for himself. Before the final Mountain Course race of the 2008 TT gets under way, fans around the circuit will be treated to a celebration of the 50th anniversary of Ducati’s first TT. The parade lap, due to leave the Grandstand in Douglas at 10.45am, is set to feature legendary Ducati racers including four-times World Superbike Champion Carl Fogarty, TT winners Sammy Miller and Tony Rutter, and Paul Smart, winner of one of Ducati’s most prestigious victories – the 1972 Imola 200. British Superbike and TT star Michael Rutter is also set to take part, alongside former racer and current TV commentator Jamie Whitham and the great Trevor Nation. There’s another treat in store for TT fans as Manx teenager Samantha Barks sings the Manx National Anthem before the track action gets under way. Sam has become a household name around Britain in the past few weeks thanks to her amazing performances in the primetime BBC1 TV programme I’d Do Anything. The show, hosted by Graham Norton and featuring Sir Andrew Lloyd Webber, Denise van Outen, John Barrowman and Barry Humphries among its panel of judges was looking for a new West End star to take on the role of Nancy in the upcoming revival of the musical Oliver. The 17-year-old made it to the final and, while she finished in third position, her stunning performances have won her legions of fans. She is expected to appear at the TT Grandstand before the Ducati parade lap.